Sticky Pad May Harness Gecko Power To Hold On To Your Gadgets | OhGizmo! The Grippy Pad holds on to your items, even in the strangest places. We’re not going to categorically say that it uses the same principle as that of Gecko feet but the company that sells it alludes to it so it actually might. If you don’t know, Gecko’s feet are covered in thousands of microscopic hairs, which allows them to cling to almost any surface without using chemical glues. 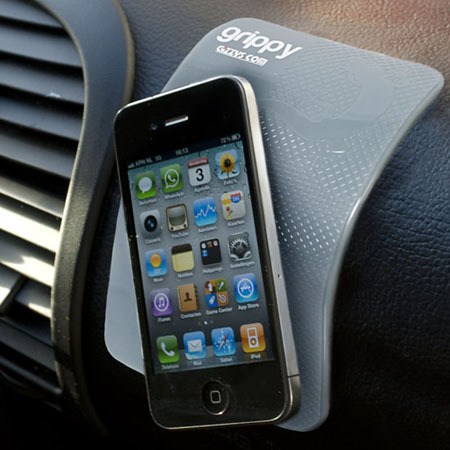 One customer on the website states that his Grippy Pad is able to hold a full cup of tea; chances are your phone will be pretty secure on your dashboard. It leaves no residue and only requires occasional cleaning with a damp cloth, probably to remove dust or other things that could get stuck to it and diminish its sticking ability. It’s also quite cheap, at £7 ($11). its a scam it does NOT work!